praised for high quality and precise output. 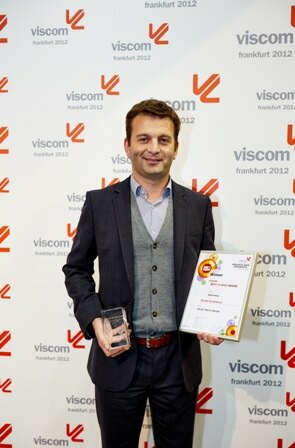 Mr Eli Keersmaekers CEO of Roland DG Benelux accepts the Viscom 'Best of 2012' awardRoland DG has announced that it has won a Viscom ‘Best of 2012’ Award in the Signmaking category for its SOLJET PRO4 XR-640 printer/cutter. The prize, which was awarded at the show in Frankfurt in October, is given to the events most innovative exhibitors. The 64-inch XR-640 combines accelerated print speeds with Roland’s integrated print and cut technology, a new print head design, both seven- and eight-colour configurations, and new Eco-Sol Max 2 inks in nine colours: cyan, magenta, yellow and black (CMYK), plus light cyan (Lc), light magenta (Lm), white (Wh), metallic silver (Mt) and new light black (Lk). Roland pointed out that the SOLJET PRO4 XR-640 is designed for volume production in the sign and graphics market allowing companies to express their creativity with high-end effects and finishes as well as developing profitable new applications and markets. Viscom is the largest trade show in Europe for the signmaking industry, taking place biannually, switching between Düsseldorf and Frankfurt. Since it was founded in 1986, Viscom has become the leading trade show for visual communication. The Viscom Awards honour the innovative achievements of the Viscom exhibitors. There are five categories for the awards: Signmaking, Large-format printing/LFP, Light advertising, Textile refinement and Software. The jury consisted of the editors-in-chief of various trade magazines, representatives of trade organisations and members of the exhibition organisation.